This was horrible. The books i've left out are definitely not talking to me at the moment. I hope they forgive me. a most wonderfully bawdy celebration of life. The central character of the book Fevvers, a circus performer whose claim that she's a Cockney virgin, hatched from an egg and is part swan attracts the attention of Jack Walser a journalist keen to discover the truth. Joining the circus as a clown, Walser is taken on a magical journey he'd never have dreamt. This is Carter's most complete novel and it's full of wonderful characters that are brought to life in glorious technicolour. a reporter, investigating a spate of cot deaths discovers that a deadly lullaby is the cause. His quest to destroy all copies of the book with the lullaby in inevitably take him to darker and darker places. With his knowledge the lullaby, can he live with its power without using it on the people who are trying to thwart him? There are some big topics in this book (abuse of power, government control), and it can be read on so many levels. Read it a second time and your experience will be completely different. His descriptions on minutae are brilliant and necessary and this is his most accessible novel to date. trying to find a coherent storyline in this book is unlikely to reap rewards. Leyner writes like he thinks, and this takes the reader on a crazy journey, where you don't get the chance to stop and enjoy the view. Insane, hyperactive and exhausting, this is a book you'll absolutely love or hate, but Mark Leyner is definitely worth a look. the best crime novel i've ever read, this dark atmospheric classic stems from a real life unsolved murder in Hollywood in the 40s where a butchered body of a woman is found. Ellroy describes in a perfectly pitched and stoccatoed style the seedier side of post war Los Angeles, and he never pulls his punches. This is the first of Ellroy's 'LA Quartet' and by far his best. George Bowling's hopes of recapturing something of his childhood by revisiting Lower Binfield, the quaint town he grew up in, are destroyed as the horrors 'progress' have turned the place unrecognisable. Written in 1939, there's an underlying theme of the impending war, and also Orwell accurately predicts how much of the landscape of Britain would change in the name of improvement. It's also brilliantly written, and captures all the best things about Orwell's writing. His characters are truly memorable and alive and he has the ability to make the reader both hopeful and angry at the same time. We'd like you to let us know your top 5 books. Please read this post for your chance to win 20, yes you heard me right, 20 books of your choice*. Click on this form below, print it out and post it to us, or drop it in. Alternatively you can email us with your choice, plus your name and we'll add it into the mix. A tragic love story, yet one which is full of hope and reminds us to never lose sight of your dreams this is a book I re- read at least once a year. The sheer poetry of Fitzgerald’s language sweeps you through the story of love lost and rediscovered, and is as far as I’m concerned the greatest novel of the 20th Century. In just a few words and often only a few pages Raymond Carver can tell you something; it may be something you thought you knew already, but with the conclusion of each story you feel that you have discovered something, either about yourself or other people. In this collection ‘Night School' is the perfect example of Carver’s compact epic style and each story carries the same power as a full length novel. Year One may be the definitive origin of Batman, yet the reason I love it is because of Commissioner Gordon. Not only does Gordon narrate most of the story but Frank Miller’s reinterpretation casts Gordon as a tough and capable cop, a family man fighting impossible levels of corruption and his own darker instincts. Year One made me see all the characters in a new light and made me realise just how great comics could be. Chandler wrote many great books but there remains something special about this debut novel, which introduced Philip Marlowe to the world. It was Chandler's use of language whether writing impossibly snappy dialogue or simply describing a sunset that made me a lifelong fan and pushed this book to the top of my read again and again list. I’ll admit I was torn between this and A Room with A View, and even though I fell in love with Lucy Honeychurch, it’s A Passage to India which wins the day. From the travelogue style opening to the aftermath of the strange incident at the Marabar caves this is a truly magical novel, which has never ceased to be relevant and thought provoking. While I never fell in love with Adela Quested, the logical and principled Cyril Fielding made quite an impact during my formative years. These are the books I read and reread most often. Magician by Raymond E Feist. Sweeping fantasy novel that spawned dozens of sequels. Enough of a mix of politics, magic and swash buckling to make you feel that this world could actually exist, but not so in depth to put you off. The Magician's Nephew By C.S. Lewis. Chronologically the first Narnia book. But actually written sixth in the series. Did you know that? It came about because Roger Lancelyn Green asked Lewis what a lamppost was doing in the middle of a Narnian forest. Did you know that? Waylander by David Gemmell. I was reading this when my first son was born, and that seemed to go alright. So I made sure I was reading it when my second son was born. It's actually a damn fine fantasy with lots of lovely blood-thirsty violence. Yum yum. Weirdstone of Brisingamen by Alan Garner. Really atmospheric children's novel, with the most claustrophobic underground escape sequence I have ever read. Ever. The Antipope by Robert Rankin. The first and - arguably – the best of the Brentford saga. Introducing us to the wastrel heroes John Omally & Jim Pooley who might possibly save the world with a well aimed half brick. What fun. Next up will be Mark's top 5. We're running a poll. A survey if you will. 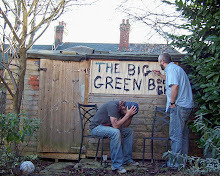 It involves everyone that's got anything to do with the Big Green Bookshop. 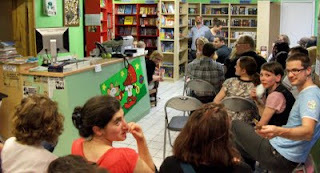 That means customers that come through the door, facebook friends, people who read this blog, friends, online customers, everyone who lives in Wood Green and the environs, and everyone else who accidently rubs against the Big Green Bookshop's rather fashionable trousers. This includes you as you're reading this. Over the next 3 days we'll be baring our literary souls and letting you know what our 5 faves are. We'll be running this poll, or survey if you will, until November 22nd (that's about 88 days), and we hope to get lots and lots of replies. Once we've got all our replies, Tim will put together a very exciting excel spreadsheet which will show us the Top 50 books. The results will be announced on November 28th. Now we realise that this isn't easy, and of course these things change all the time depending on all sorts of factors. But we're offering a great prize for one person chosen at random from everyone who sends us their choice. That person will win 20 books OF THEIR CHOICE from the official Big Green Bookshop Top 50. So tomorrow morning I will be listing Mr Tim West's 5 favourite books of all time (in no particular order), and also I'll be attaching a little thing that you can fill in and send back to us. We do hope you'll join in and also we hope you'll spread news of this poll, or survey if you will, all over the world wide web. Tim's on holiday at the mo, so forgive the lack of bloggage. Maybe tommorow, i'll be able to catch up. If Britney Spears were one of these, she would have sung, 'I'm a tadpole, not yet a frog'. It's unlikely that this would have charted. The Man Booker Prize is probably regarded as the most prestigious literary award in the UK. It’s awarded each year for the best original full-length novel, written in the English language, by a citizen of either the Commonwealth of Nations, Ireland, or Zimbabwe. A couple of weeks ago the 13 book longlist was announced, of which 6 will make it through to the shortlist, announced on Tuesday September 8th. This is 4 weeks before the winner is revealed to the watching millions on October 6th. Last year it was White Tiger by Aravind Adiga, and this year’s longlist includes some real heavyweights, including Hilary Mantel, William Trevor and Sarah Waters, aswell as newer authors such as Samantha Harvey and James Lever. As soon as the shortlist is announced, we’ll order copies of each of the books, which we’ll hopefully get by Thursday September 10th. The group will meet on that evening to say hello, take home one or more of the titles, and enjoy some rather lovely wine (I might even get some Pimm’s in). Over the next four weeks, the members of the Book Club will make a concerted effort to read as many of the six books as they can. The group will meet once again on October 6th, before the winner is announced, and discuss each of the books. After a heated debate, and a glass or two of vino, the group will vote for who they think should win. We’ll then watch the televised ceremony, and hopefully cheer as our choice and the actual winner is one and the same. Or more likely, shout and curse as our least favourite book takes the glory. •For a one off payment of around £20, we will be a lending library, where you can borrow each of the books for a week each. You can also keep your favourite book after the ceremony. •We will offer a minimum discount of 20% on the shortlist for Book Group members (this may be more depending on how successfully we can negotiate with the publishers). •A group of you could share the cost of the books and each buy a couple of books to pass around between you. We’ll do whatever we can to help but the important thing is that you all get a chance to read the books… and you all come along. Please contact us if you’re interested, with an email address and /or your phone number. We’ll be in touch to finalise details nearer the time. For the full longlist and more information about the Man Booker Prize please follow this link. 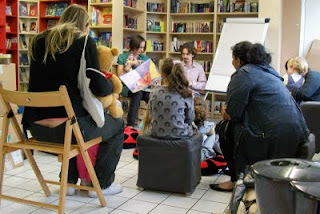 On Wednesday we were very lucky to host an evening with Greg Stekelman. Greg Stekelman actually exists in human form. He isn't, as is often assumed, a creation by microsoft designed for the benefit of late night internet browsers. Greg can be found in various guises online. Twitter , where his following includes Adam Woodyatt and someone calling herself JenniJuggs. Facebook, a socail networking site that connects people with friends and others who work, study and live around them. But more importantly he owns this website. 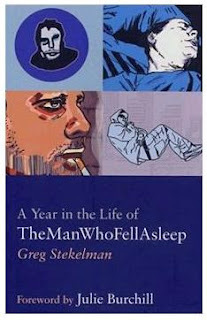 TheManWhoFellAsleep.com is, as you will probably find if you check it out, a rather special, clever and entertaining world where nothing should be taken for granted. The website was noticed a few years ago by the Friday Project, a publishing company specialising in finding material on the web and then turning it into books. They asked Greg to write a book (that being their job), and so he did. You can buy it from our shop or online on our website. It's a dead good book. The shop was jammed with people, as Greg hasn't done an event for 3 years (citation needed) and the free wine was flowing rather well. Here are a few choice shots of the magnificent evening. Greg reading from his book. The till is not as big as it looks. 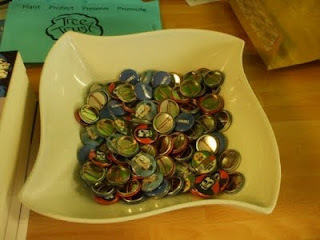 Exclusive, TMWFA (TheManWhoFellAsleep) badges available on the night. I just won a prize in the raffle. Oh yes... there was a raffle alright. It was all great fun and the Greg was brilliant. I think that everyone had a good time, and by the number of wine bottles I cleared up the following morning, I suspect some of the audience are just waking up. On Monday we hosted an evening with the Hornsey Historical Society. Hornsey is a district in Haringey which sits just west of Wood Green. It's a 41 bus ride away, and much like Wood Green, there's a lot to admire in Hornsey. The Society funds itself primarily through selling books (and postcards and maps and dvd's) and they have a lovely shop in an old Schoolhouse on Tottenham Lane. You should go there if you're in the area (after you've been to visit us of course). We also sell a lot of their titles and they're very popular. We've built up a very good relationship with them as, I guess, we're both advocating a similar respect for our prospective areas. 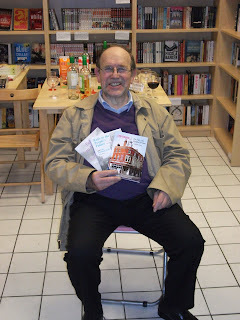 Anyway the evening was a great success, and Albert Pinching (a man who probably knows more about Wood Green than the famous Woody Green from Wood Green's Woodiest Greenest bit), author of Discovering Old Wood Green and Wood Green Past amongst others, was a wonderful and charming speaker. Wine was drunk, books were bought and local history was celebrated. Here is the legendary Albert, relaxing after his glorious performance. Thanks Albert and Keith for coming along. Last Friday Karen Wall and Jim Helmore came along to the Big Green Bookshop to read their fabulous kids books 'Who Are You Stripy Horse', and 'Look Out Stripy Horse'. .
We've been doing story telling every Friday over the Summer Holidays at 1.00pm, and depending on how popular they are, we'll probably carry on in September. Anyway Jim and Karen were great and the kids had a blast. Karen drew a couple of great Stripy Horse pictures and everyone who came along will know to 'always read the label' from now on. Saturday was our Eco Day, which we've obviously been keeping very quiet about, as precisely 1 person turned up. It was just one of those things which happen sometimes. Thankfully we now know how to make a book out of recycled material, and also I am now the master of constructing rain catchers. 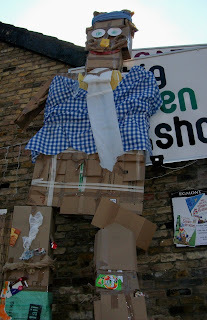 We also advertised that we'd be making a 'Garbage Man' out of all the rubbish we've collected over the last week, to highlight how much waste there is and how important it is to recycle. The lack of Eco punters didn't put us off, and this is the result of our afternoon's work. The gentleman on the right is from the local newspaper who turned up to take a photo or two of this momentous event. So at least he knew it was happening. 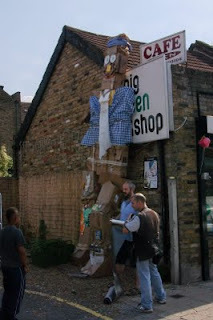 So kids, you should have been there to see the 18 foot tall man mountain of rubbish. But you weren't. Ah well. I shall be writing about grown up things again soon, includig our Booker Prize Book Club, which i'm sure you'll all want to be part of, but until then, I bid you adieu. Yay, a new post. It's been a while. 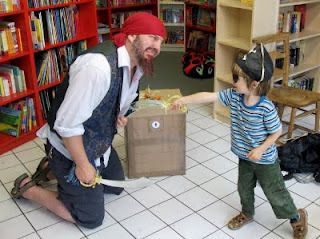 OK last Saturday we had a pirates and princesses day at the bookshop. 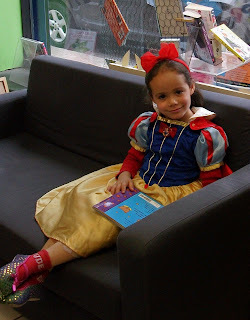 There was a Pin the Parrot on the Pirate competition, we made lovely princess crowns, there was a lucky dip for both girls and boys and there was also a dressing up competition. You have to vote for the best Pirate or Princess. The definition of 'best' is entirely up to you, but you have 6 days to choose your favourite. The winner will, once again get something worth at least £12.50, so you'll understand how important your vote is. Here's number one This is Princess Tiara Prettynose the third. And number three This is Dread Pirate Doom McDangerous. He's just dispatching that lilly livered scoundrel Timmy Redbeard. So there you have it. The choice is yours. Please vote.